Bring elegant storage and display space to any surface with this decorative glass case. The clear glass panels provide an excellent view of the items displayed within, and the brass-tone metal frame brings both structure and antique-style elegance to this case. 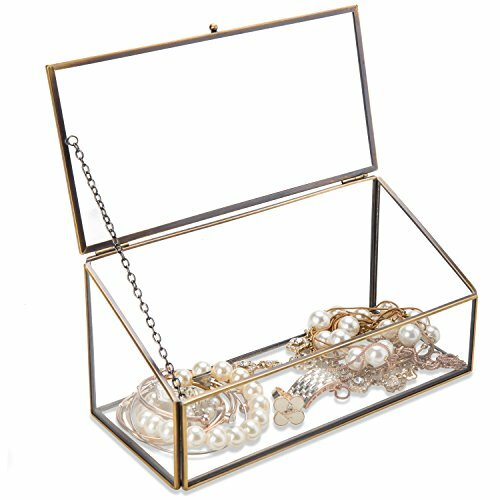 Use the small metal handle to lift the hinged top lid and fill this display case with jewelry, seashells, and whatever other decorative items you wish. When you want to bring a stylish decorative accent or centerpiece to any space, this glass display box is the perfect choice. Approximate Dimensions (in inches): 8.5 W X 4 H X 3.5 D.
A decorative storage and display case made of clear glass with a brass-tone metal frame. The elegantly-slanted top lid features hinges and a small handle that make it easy for you to lift the lid and fill this box with whatever you wish. Perfect for stowing and showing off jewelry, sea shells, and other small decorative items.